missing a lot of the stunning coast? Wouldn't we be better off covering more miles in a car? It turned out we were wrong about everything. 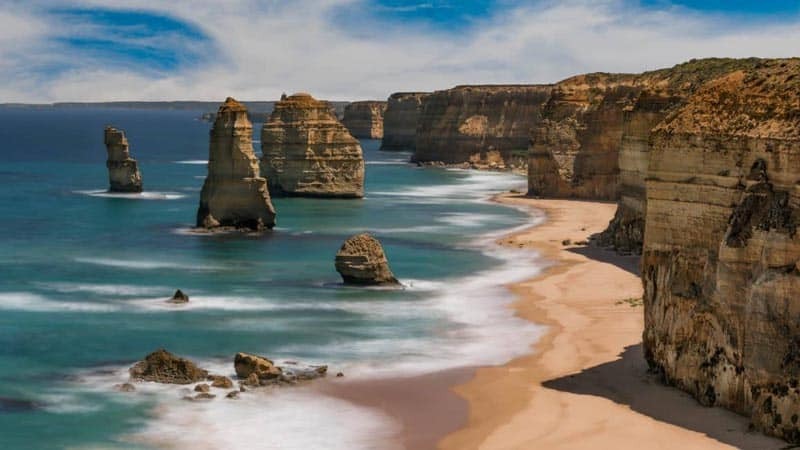 If you want to see this magnificent coast in Victoria, Australia, the Great Ocean Walk is the way to go. Our trip began in Melbourne Australia where we were picked up at the downtown Travel Lodge for our two-hour drive out to our luxury camp. 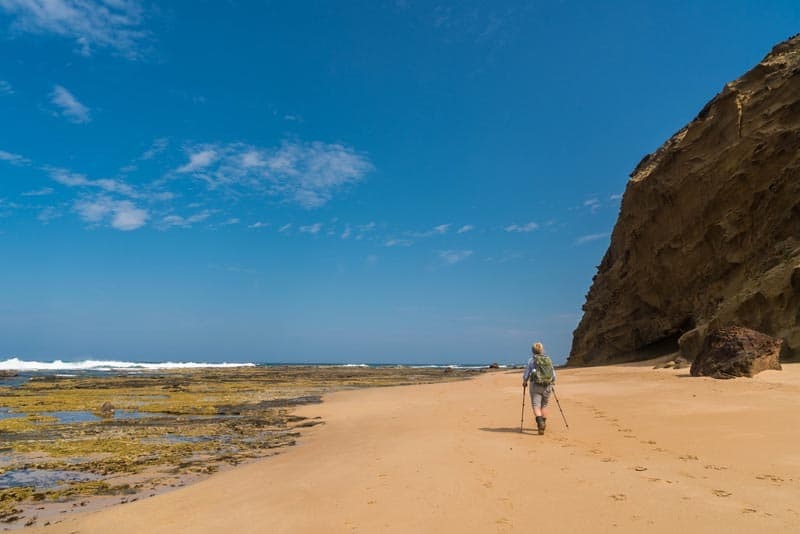 The Twelve Apostles Lodge Walk is a four-day, 56 km trek along the coast out to the finish at the incredible Twelve Apostles. 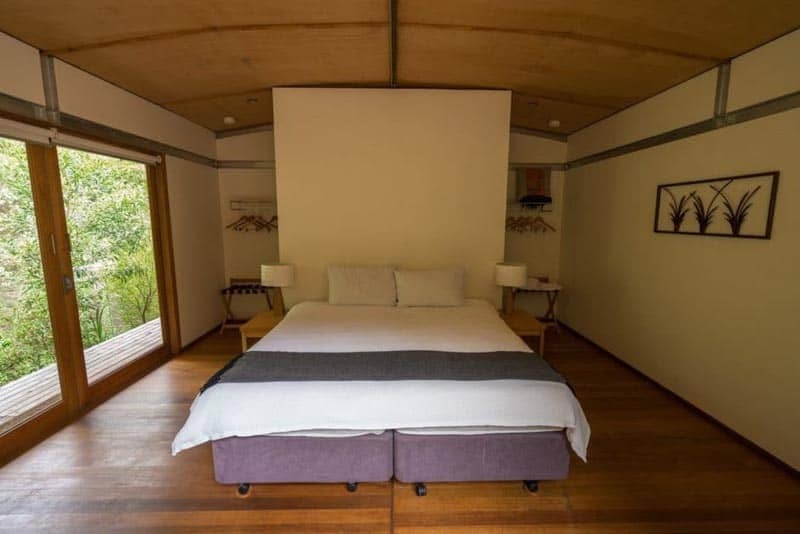 We were expecting a hut to hut walk, but instead, the Lodge is located in a central location where you are dropped off and picked up each day after a vigorous hike of anywhere from 12km to 18km per day. 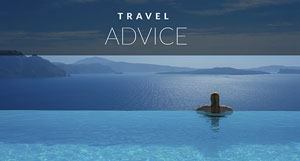 Subscribe to our YouTube Channel for weekly travel videos! 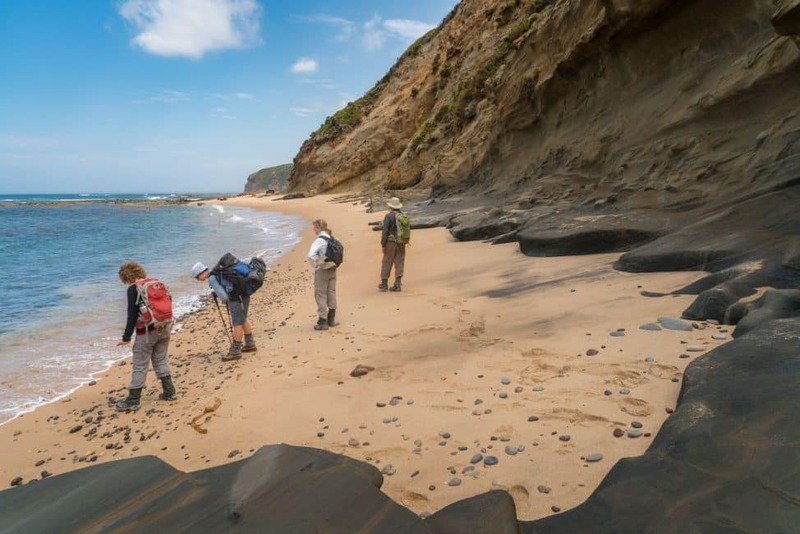 The 12 Apostles Lodge Walk is a twist on the usual coastal/camping walk along the Great Ocean Walk. We are still walking the entire route like everyone else, but each night we get to go back to decadent private rooms, for hot showers, hot dinners and hot foot baths to soak our aching feet. 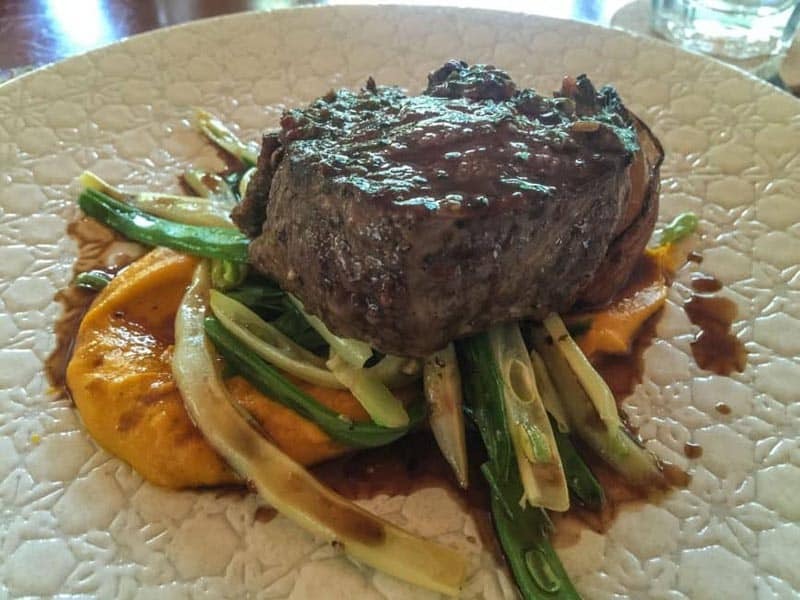 The lodge is luxurious and relaxing with incredible meals served daily. 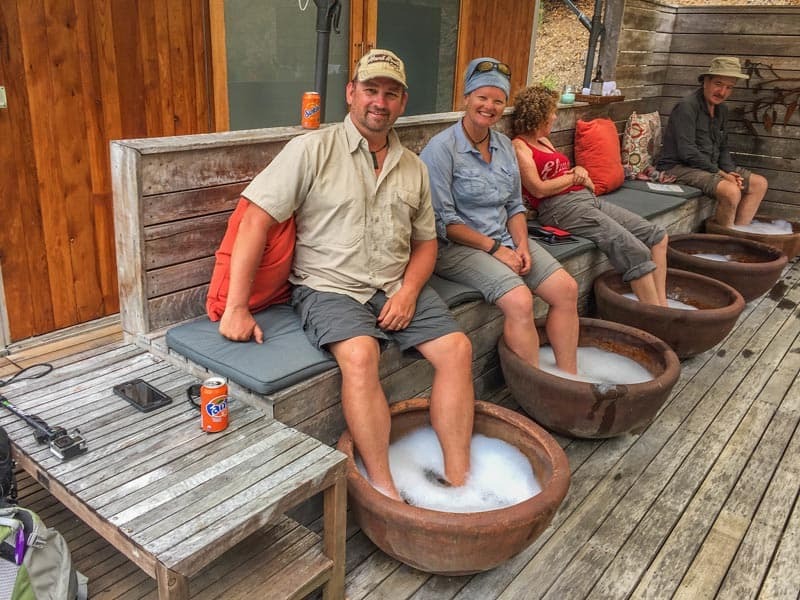 Each night after the walk we are treated to canopés as we sip ice cold beers while waiting for the chef to prepare exquisite dinners. We had heard that the food was delicious, but we didn't expect it to be so good. 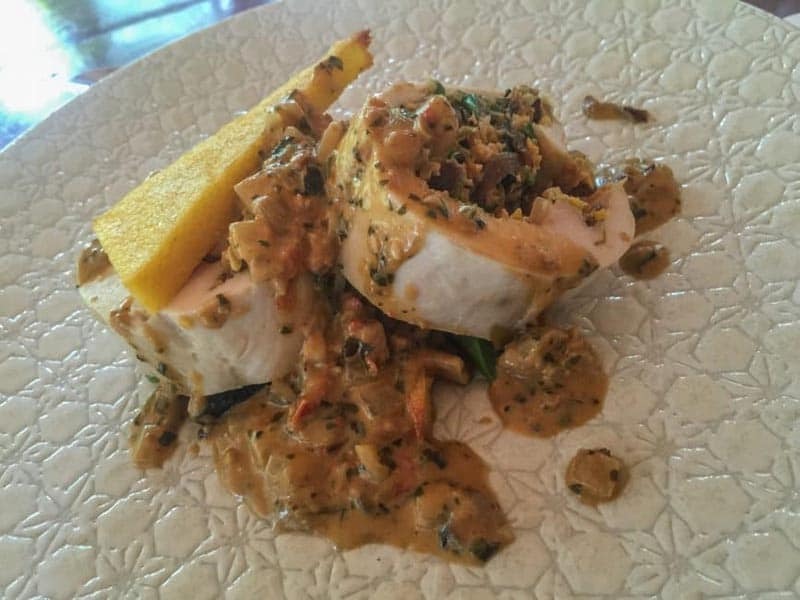 Each meal was thought out with great care creating meals that not only satisfy our huge appetites after a long day of walking, but also rivals top restaurants located downtown Melbourne. 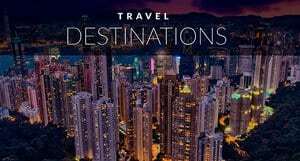 Visiting Australia? 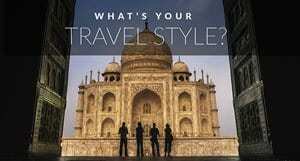 Don't forget your LonelyPlanet Travel Guide to Melbourne and Victoria. We were given healthy and hearty meals to carry and eat on the trail and breakfasts were a mix of fruits, eggs and fresh breads. If you are planning on losing weight on this walk, think again! As soon as we arrived, we ate lunch and received our care packages for the trip. 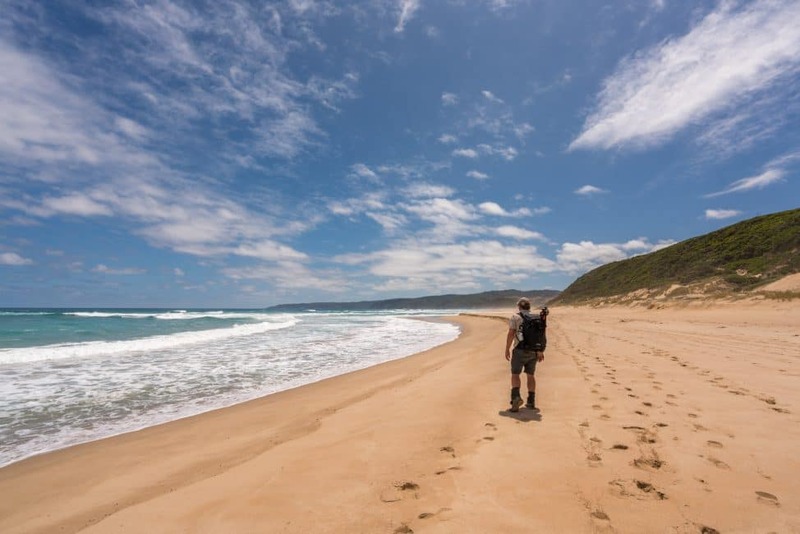 The Twelve Apostles Lodge Walk provides everything you need complete with backpacks, rain coats, sunscreen and bug repellent. They even gave us sun hats which was a bonus considering I lost my hat the day earlier. After a quick briefing, and packing of our bags where we picked up a snack for the trail, we hopped in the van to be taken to the beginning of our trek. 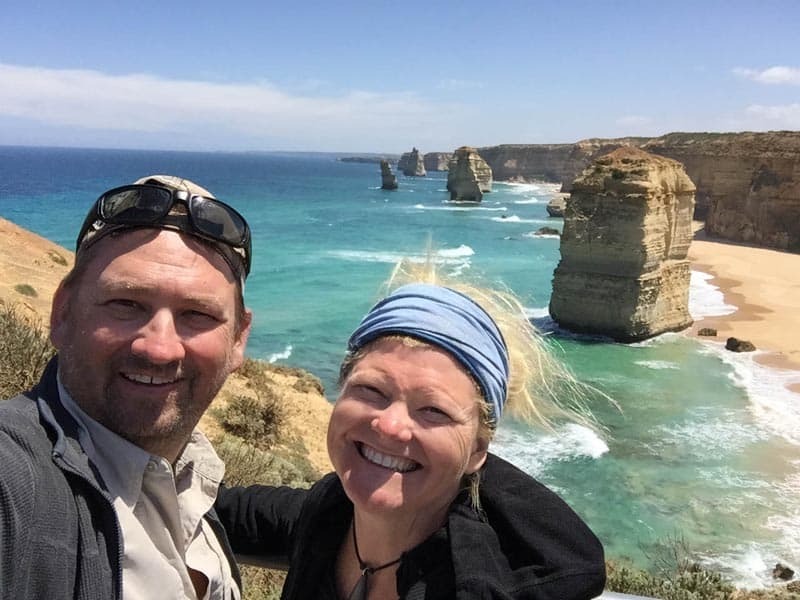 It started at the only place where the Great Ocean Road and Great Ocean Walk meet before the 12 Apostles. It was a short day today at only about 8 km. The first day was all about getting your legs in gear for the days ahead and taking in the incredible views. 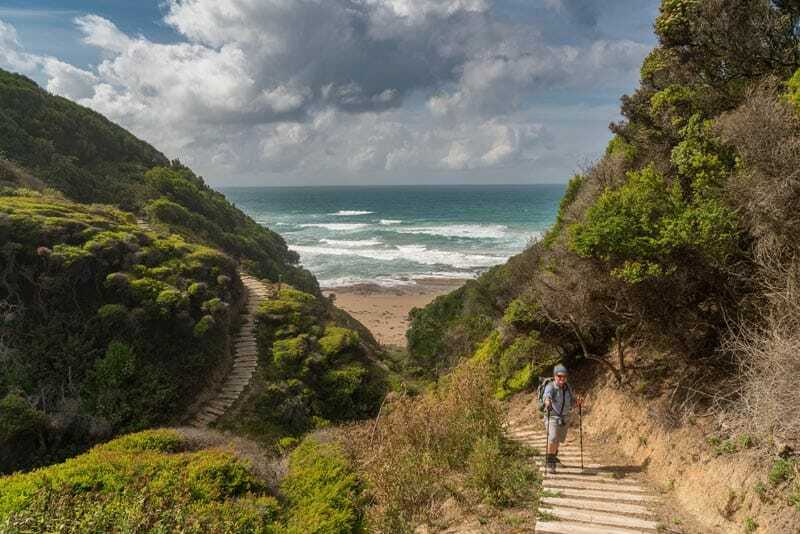 We got the chance to experience the different types of terrains of the Great Ocean Walk from narrow trails on high ledges to long walks on isolated sandy beaches. It was hot, it was challenging and we wouldn't have it any other way. Dave and I stopped a lot to take photos and videos, but we managed to catch up regularly with out group before moving on again. The lodge keeps groups small and our tour was made up of five people. A lovely couple from England who inspired us all. Over the age of 70, they both kept a brisk pace making any 40 year old feel out of shape. Another journalist was on our trip as well and hiking is her forte. She walks daily at her home in Melbourne and all that walking paid off as she led the pack each and every day! Dave and I couldn't pass up any opportunity to snap photos and videos of our time on the trail. I could tell we were worrying our guide as she kept trying to hurry us along. By day three, she finally gave up and said, we'll meet you at lunch or our first tea break. We always found the group. Each day of hiking was quite different. It made for exciting walks that rarely felt repetitive. One minute we'd be walking through thick brush and the next we'd be climbing a huge staircase of 132 steps straight up a cliff. We walked on beaches cluttered with shipwrecks and through fields cutting through farmland. 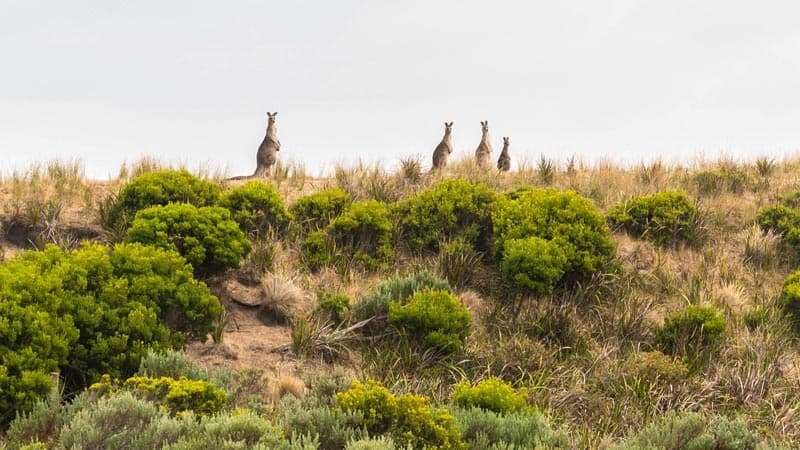 We saw kangaroos hopping over hills and even spotted a hedgehog hiding under a shrub. You can go as hard as you like or take it as easy as you like. Each morning you are offered the choice of taking part in the endurance walk. Dave and I wanted to wimp out and sleep in and skip the 6km-8km extra portion, but we had a serious fear of FOMO (fear of missing out) so we got up each day and joined the team. I'm glad we did, because the early morning walks were our favourites. We were amazing at how quickly we were able to walk. I always looked at myself as a person that would top out at 10km per day, but here we were walking up to 18 km each day and still managing to finish up by 3pm. It was tough at times and we were often relieved when we came to the end just as the heat and sun became unbearable. While covered in sweat and dust we arrived at the finish line where fresh ice cold water with lime cordial awaited to quench our thirst and cool us off. I never knew lime cordial could taste so good! After a few quick stretches, our group and guide hopped in the air conditioned van to make our way back to the lodge where cold beer and snacks were waiting. 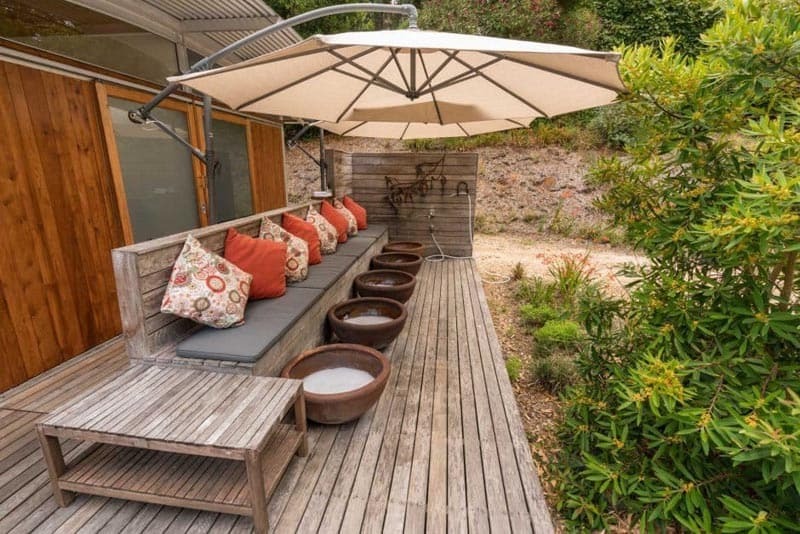 The best is being able to have a hot shower and then to sit under the shade and soak our feet in hot bath salts as kangaroos hopped in the yard. With a few hours to relax before dinner, we took naps, read a book and enjoyed some quiet time. The lodge offers 50mb of Wifi each day, but our cell service worked fine here as well so we could send the odd Instagram photo or twitter update. 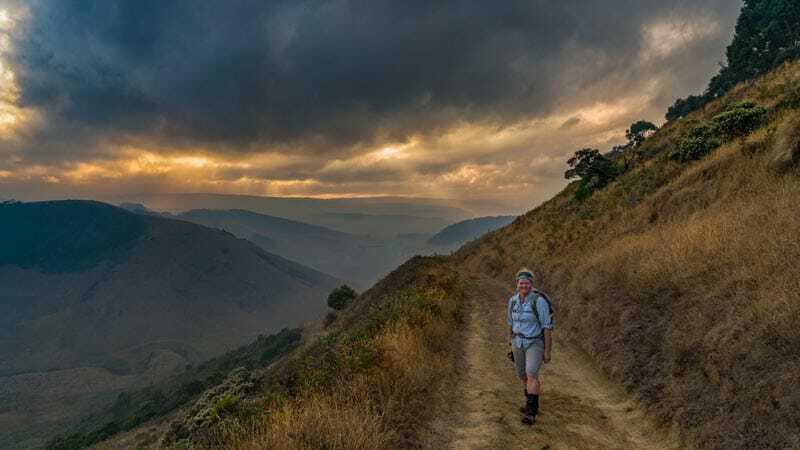 After delicious four course dinners created by our chef, our guide goes through the following day's itinerary and gives us the option of taking part in the endurance walk. Naturally we all volunteer, so it's early to bed for a long day ahead. Arriving at the 12 Apostles is an amazing payoff. After four days of walking, we arrive before the crowds at one of Australia's premiere sights. Massive cliffs line the coast as wooden platforms line the sea. We walk on the beach for a closer look before our helicopter tour of the 12 Apostles. 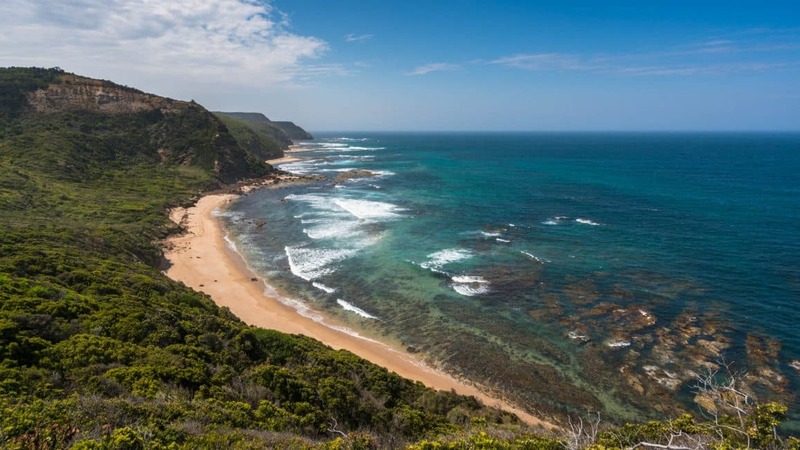 The helicopter tour is offered in your package to walk the great ocean road and we highly recommend booking it. The 10 minute flight over the 12 Apostles give you a birds eye view of this extraordinary sight. 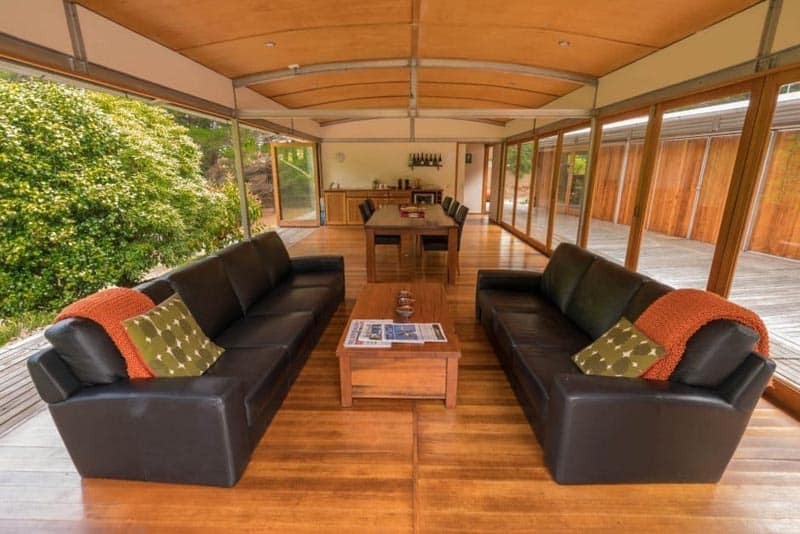 You can understand why so many people flock to see it. After the flight you are free to walk to the main area to view the coast from all directions. The crowds get heavier as the day goes on, but make sure to enjoy the scene as you may never get to witness such a stunning coast again. Don't forget to Subscribe to our YouTube Channel for videos straight to your inbox! After our tour ended, we were shuttled back to Melbourne. We left our bags packed outside our rooms in the morning where the lodge staff packed everything into the van to take us back. But not before we had a shower at the local hostel. 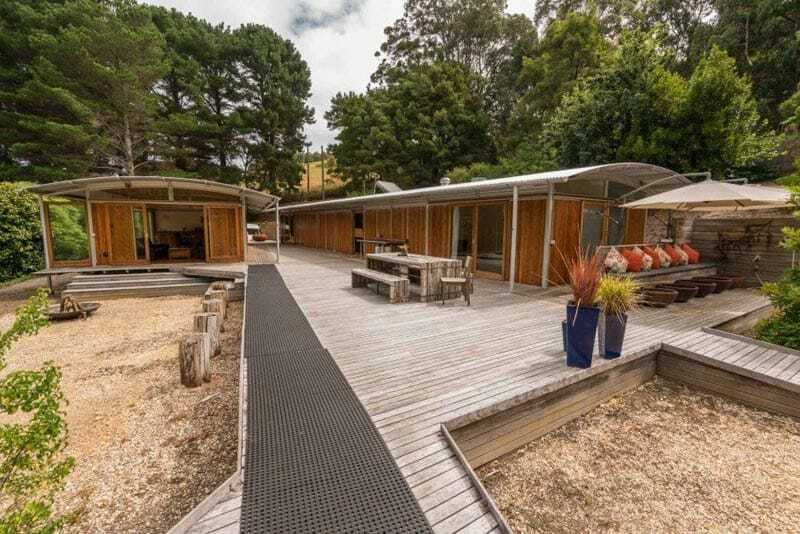 The Twelve Apostles Lodge Walk has a special agreement with the hostel and while everyone is out on their tours, we had hot showers to ourselves. With a fresh bag of clothes packed and a hearty lunch to give us strength, we were ready for the three hour drive back to the city. 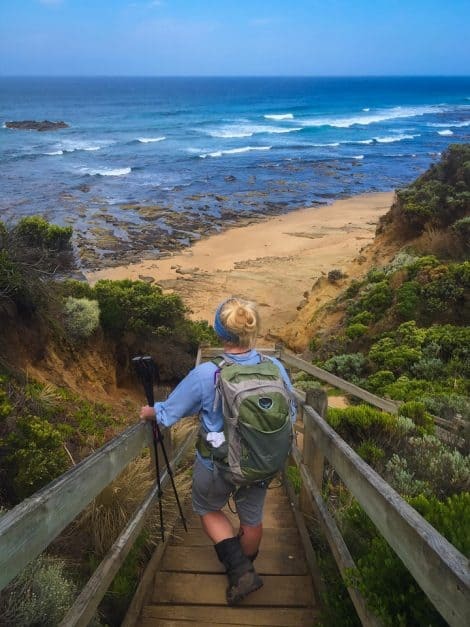 The Great Ocean Walk is an experience you'll never forget. 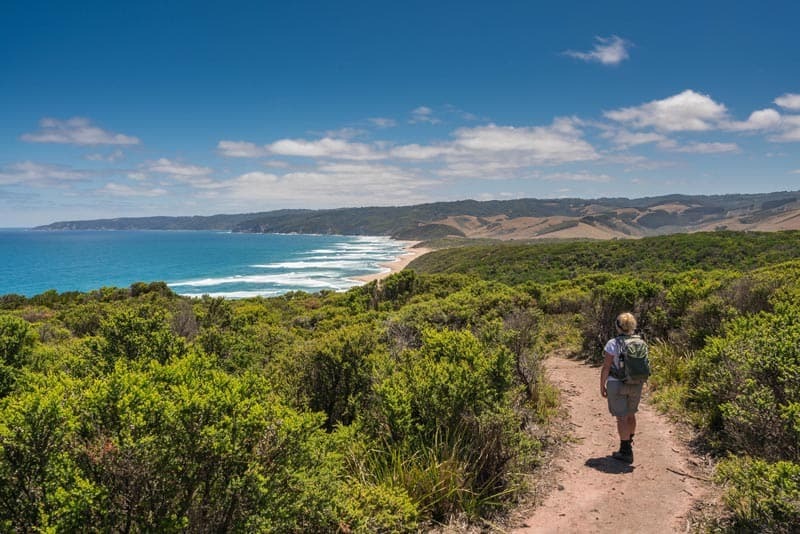 Instead of simply driving the Great Ocean Road for one short day, try something new and walk it. You'll feel a sense of accomplishment finishing something so epic, but more importantly, you'll see a coast that nobody else gets to see. No roads go along this route, it's just you, the other hikers and kangaroos out in the greaet outdoors enjoying the best of Mother Nature. 19 Responses to "Great Ocean Walk – A Beautiful Way to Experience the Twelve Apostles"
This is an awesome post and very useful as we’re a family of four (including a 5 month old and a 3 year old) from the UK travelling Australia for 3 months. We’re going to be driving the GOR halfway through our trip so this has some great inspiration. Currently in Perth, having just left Singapore. 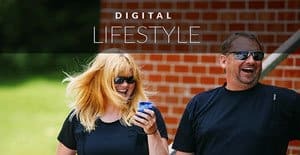 We’ve started documenting our travels on our own blog at https://williamsoztravels.wordpress.com. We hope that ours is as useful and inspirational as yours! Wonderful wrap-up of the walk folks! I’d live to do the walk worth the kids before they fly the coop! I used to run backpacker tours down there, love the GOR! Wow that looks 10x more fun! 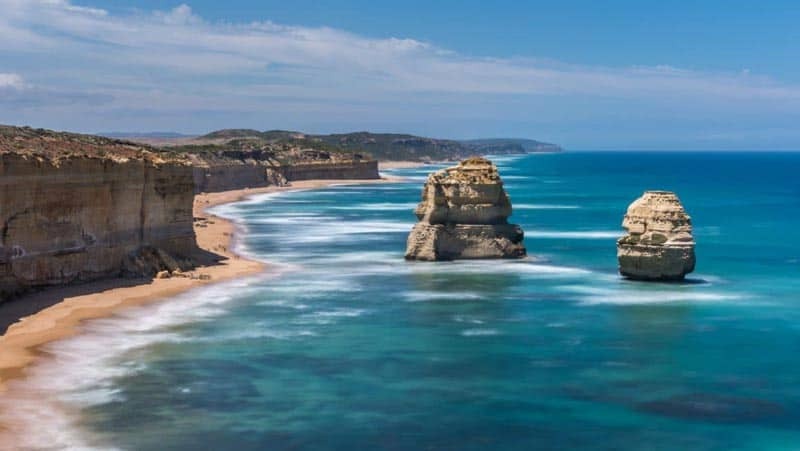 I live in Melbourne and always take my traveller friends along the Great Ocean Road when they come to visit, although now I might opt for the hike instead of the drive! You would love the hike James. It would probably be awesome for you too, to do something different. 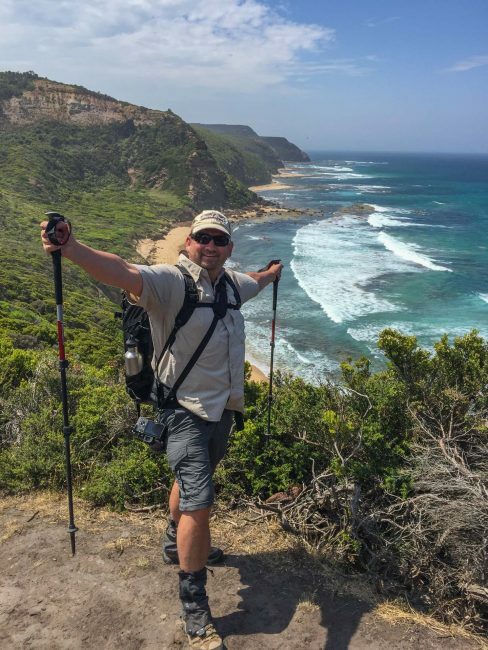 The Great Ocean Road is amazing, but I know that doing something different is always welcome. We live near Niagara Falls and love it, but whenever we discover a new adventure there, we jump on it to have a different perspective. By Watching this video, I am so exited to tale a such tour. Amazing guys! We are hitting the GOR on Monday for two weeks. We won’t be walking the whole way like you guys but will be doing smaller parts of the walk as we slowly make our way along. I visited the GOR when I was a kid and have very fond memories of it, so much so that I use to tell everyone that it was my favourite place in the world. I’ve since discovered many more amazing places but hope that it wow’s me like it did as a kid. I doubt you saw a wild hedgehog, but I would be willing to believe you may have spotted an echidna perhaps???? Wow! I’ve only ever driven the car along the great ocean road a couple of times. Walking it looks absolutely amazing. I love those foot spas too! Haha. All the sore feet would be so worth it to get those magnificent views. Thanks for sharing this.